added new exciting products such as bulk seed, cold frames, all natural deer repellent, and much more. lowered prices and shipping rates. added more info on all seed varieties including packet quantities. These 3 offers can be redeemed. $2 flat rate shipping for seed only orders. Any size order from $5 up is just $2 for shipping and handling, so the more you order the more economical it is! 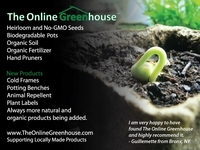 Receive 3 free seed packets for free when you order $50 worth of anything from The Online Greenhouse. The seeds may be something you have never grown before! It will be exciting to see what you get. Just type 'Surprise' in the comments section of checkout. Type 'postcard' into the coupon field during checkout for $5 off total order. Thank you for your interest in The Online Greenhouse's "Fertile February Sweepstakes". This Sweepstakes has ended and the winner is being contacted. Thank you for your support. Here is what the winner will receive. 23 - Packets of Heirloom Vegetable Seeds. and of course it all ships free to you.